The Golden State Warriors believe that Dallas Mavericks rookie Luka Doncic is not only an All-Star-caliber player but also a superstar in the making. Even on a night when Stephen Curry scored 48 points and hit 11 3-pointers in a 119-114 win over the Mavericks, it was Doncic’s promise that was a large topic of postgame conversation for the back-to-back NBA champions. After watching the 19-year-old rookie go off for 26 points, six rebounds and five assists later in the night, the strong opinions about Doncic’s game only strengthened. 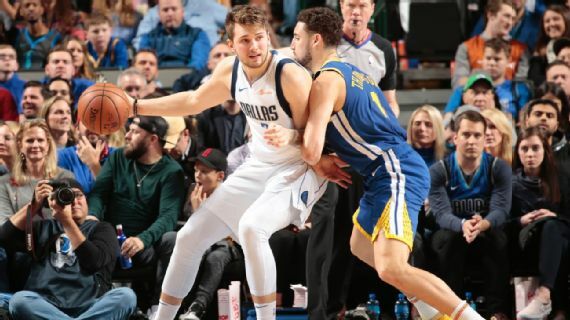 Like many around the league, Warriors All-Star forward Kevin Durant believes that Doncic’s time as a professional in Europe has made his adjustment to the NBA that much smoother. Steve Kerr says Warriors aren’t looking at season as final dance Warriors confident Klay Thompson will break out of slump soon Spurs shut down makeshift Warriors in fourth quarter Will the real Rockets and Warriors reveal themselves in Game 7?